Ghost in the Shelves is local multiplayer VR experience where the 2 players experience being in a haunted cabin. 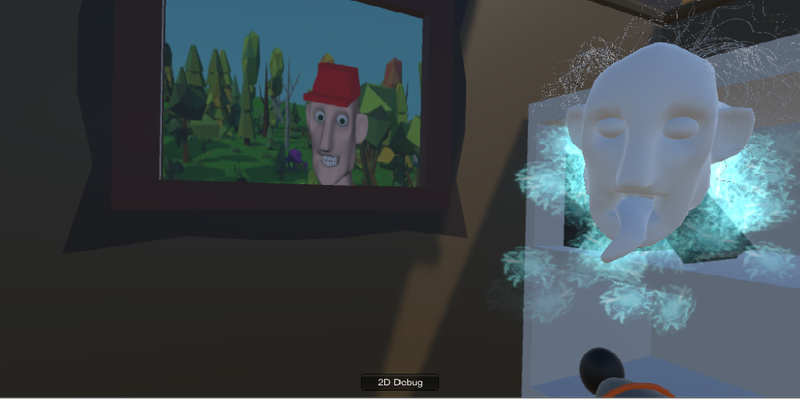 The one player takes the role of a ghost using one of the vive controllers and the pc screen as a CCTV where both the player and ghost is visible, while the other player is a visitor in the cabin using the vive headset and the other controller. Both of the players are moving inside the play area. The cabin is haunted by the ghost, where it attempts to do as much paranormal activity as possible by throwing around objects, scoring points for this activity. At the same time the visitor attempts to kill the ghost using his/hers GHOSTOMATIC 3000 ghost purging gun. The ghost is invisible, therefore the player needs to figure out its position by looking at the in-game objects the ghost throws around, and shoot it. After the visitor kills the ghost, the players swap roles. The winner is whoever has the highest score as a ghost.